The Global Digital Marketplace project has taken dxw digital to a number of countries this year. 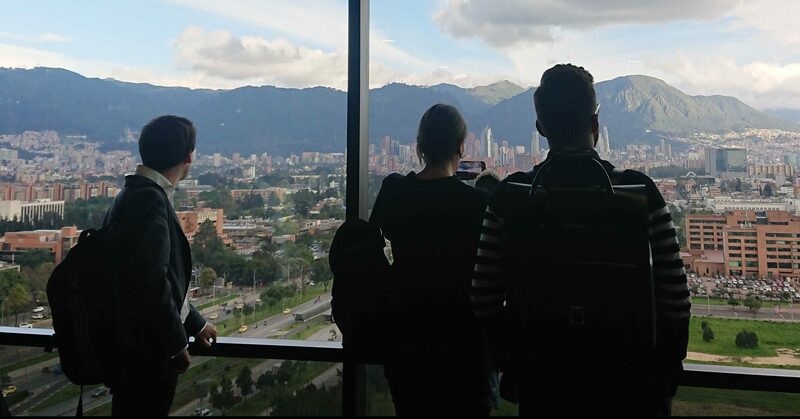 Along with our partners from Oxford Insights, we’ve travelled to Colombia, Indonesia, Malaysia, Mexico, and South Africa in the last three months to conduct procurement and supply chain user research with procurement professionals, suppliers, non-governmental organisations, and civil servants. This is new territory for us as, until now, we’ve focused on designing and building better public services in the UK. Here are some user research lessons from the field I’ve learned along the way. Before we hit the road, the team and I prepared nine different activity guides and numerous support materials. These included posters with session objectives, experience card templates in different languages and post-session analysis cards – everything we needed to create focused, information-rich research sessions. We had a detailed plan and lots of activities prepared for our research sessions. Once we arrived, most of those went out of the window. It wasn’t for lack of trying, but international research on behalf of the Government is much harder to predict than domestic research. There are lots of variables that are out of your control, like room size, the number of participants, their expectations for the session, their availability, and the mix of junior and senior people which can affect the type of information that’s shared. While we weren’t able to do much of what we planned, the guides we prepared were invaluable. We were able to extract key questions from different discussion guides and quickly build new sessions at short notice that kept us focused on our research objectives. 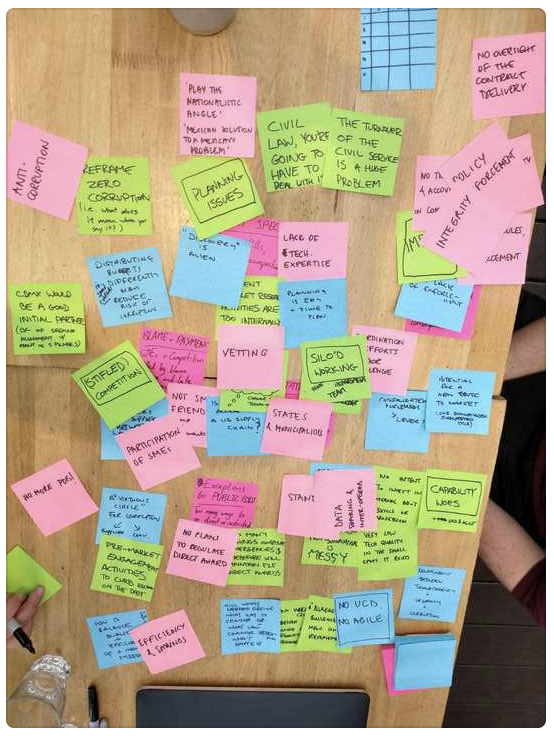 When you’re working with 3-4 other teams simultaneously and your participants see the session as a government-to-government knowledge exchange rather than a user research session, it’s more important to be able to find a way to meet your research objectives than be a Sharpies and Post-its pusher. Understanding your primary research objectives, asking good questions and listening actively to your participants’ answers is fundamental in user research and no matter how large your user research toolkit is, you shouldn’t underestimate the value of these core skills. The public sector in the UK has a thriving service design mindset, which is a great environment to be in as a user researcher. It allows us to try new things and experiment with different ways of gathering insight like running co-designs or making experience maps. But these methods are sometimes unfamiliar and can be a distraction or too removed from participants’ expectations. In this case, we were advised not to do any of these things until we’d built up enough rapport with our participants. Semi-structured interviewing was a good way for our team to understand the language people use when discussing procurement and their mental models for the work they do. In some instances, where we saw participants a number of times, we were eventually able to run some other activities. For those we only had one meeting with, semi-structured interviewing proved to be a quick, understandable, accessible, and invaluable way of cutting to the heart of our research objectives. No matter how much you think you’ll remember what you heard and saw, you just won’t. Travelling abroad for work is exciting, tiring, and enriching, but do your future self a few favours and stay organised while you work. 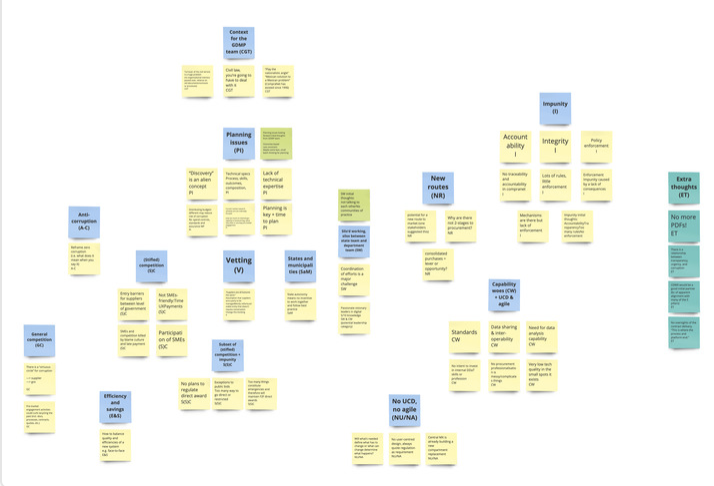 Separate post-it piles from various analysis and research sessions. These post-its have been to the Americas! Bring lots of envelopes and paper clips with you. These will help you keep the materials you’ve created together where they need to be together, and separate where they need to be separate. Label your session notes with the right date and session numbers right at the beginning of a session, and save yourself the detective work when you return home. Don’t rely on the photos you took. 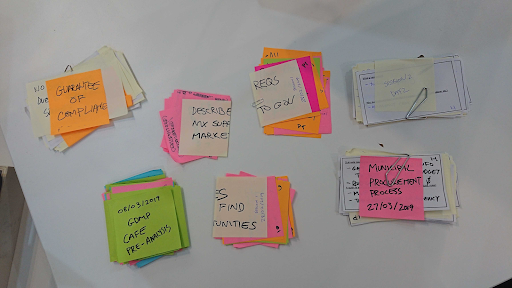 Sometimes you’re in a rush and the photo you were relying on to recreate your experience map is useless because it’s too blurry, or there are five rogue post-its floating around in your bag and you swear they’re part of a really crucial stage of…something. Have a reliable labelling system for any diagrams or maps you create during a session so you can recreate them easily. Label your grouped artefacts with a description of what they’re showing, the date, and the research session. For individual items that form a whole, such as post-its, this means labelling each one in a way you’ll know which order they’re supposed to be in and in relation to what. Whatever you do, plan ahead to give your future self half a chance. Now that our trips are complete, dxw digital, Oxford Insights, and the rest of the multi-supplier team on the Global Digital Marketplace are diving into analysis. We’ve learned about the different ways the participating countries operate and the plan is to identify where and how the 5 pillars of the Global Digital Marketplace could support each country’s vision. The post Global Digital Marketplace: lessons from the field appeared first on dxw digital.